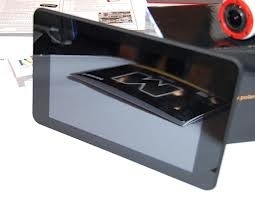 Polaroid introduced its new Android powered 7-inch M7 and 10.1-inch M10 tablets at CES 2013. Both the smooth devices include 1280 x 800 pixel displays with 2-megapixel front-facing camera integrated with a microSD slot and Android 4.1 Jelly Bean. The M7 Tablet is sleekly equipped with a dual-core processor and 8 GB of internal storage while M 10 features a quad-core CPU, 16 GB of internal storage, HDMI and 5-megapixel rear camera. The M10 tablet will be stepping up to a quad-core processor as it offers the same display resolution which provides a lower pixel density than the smaller version. This 10.1-inch display is whopping up with 7,800 mAh battery life. The biggest thing is that the smaller of the two tablets, M7 is been priced at just $129 and bigger one, M10 at $229 in US market. Both the devices are blended with Wi-Fi Bluetooth. Enjoy these most performed tablets at minimal price.